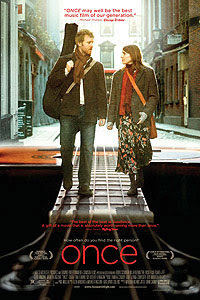 Once is the perfect title for this critically acclaimed sleeper by writer/director John Carney that was not only nominated for the Grand Jury Prize but earned the World Cinema Dramatic Audience Award at the Sundance Film Festival. A movie this rare and beautiful can only be named Once and as I sit down to collect my thoughts, I realize that it seems nearly impossible to describe the film in a way that would do it justice. Sure, it’s charming and magical, yet real and simplistic—nearly perfect musical filmmaking, although to call it a musical is an inappropriate shortchange as it contains no dance numbers, doesn’t follow the genre mold and relies solely on people expressing earnest emotion through song for personal and artistic reasons instead of simply the big razzle dazzle showstoppers we’re used to viewing. However, this being noted, you will catch yourself nodding and toe-tapping along from the heartfelt compositions in this partially autobiographical work from Carney, formerly a member of the band The Frames who was a struggling Dublin musician while his love lived in London. Carney cast his old band-mate Glen Hansard as a character simply named “Guy," who lives with his father and works as a “Hoover” repairman by day but comes alive at night singing his lungs out on street corners. And it's there where he meets “Girl,” (Marketa Irglova) a Czech immigrant with whom he embarks on a musical friendship with the stirrings of a romantic attraction, although they are still stuck on past loves and sublimate their budding feelings through gorgeous collaborations. Not only have most critics expressed in their reviews that they found themselves wanting to see the film more than once, I found myself instantly curious about the film’s singer who struck me as a cross between Connor Oberst and Damien Rice. Simply put, I was ready to not only immediately view the eighty-eight minute whirlwind one more time but purchase the soundtrack as well. It’s a hopeful movie that will make audience members long to have kept up practicing their pianos and guitars all those years ago and music lovers shouldn’t miss it.